Stan Lee once decreed that his superheroes should inhabit real cities, so New York City is now the home to hundreds of fictional comic book superheroes. It also plays a role in many comic book movies that need an iconic city to call home. So, with ten Fiesta Agents already in New York for NYCC, Ford and the Studio@Gawker thought: Why not make a tour of Manhattan’s most iconic comic book destinations? 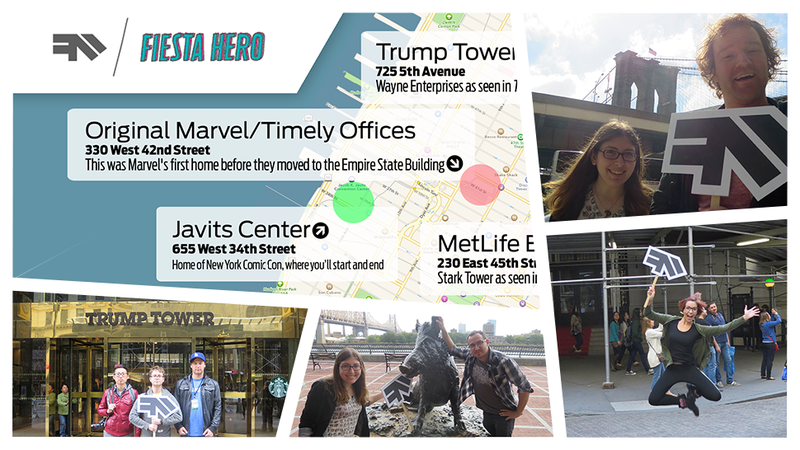 Here’s a guided tour (and handy map) of New York City's superheroic sights. The first location on our list is a nod to Stan “The Man” Lee himself, the creator of hundreds of Marvel Comics superheroes and villains. These are the original offices of Marvel’s predecessor, Timely Comics. The imprint was founded in 1939 in the McGraw-Hill Building at 330 West 42nd Street. The company stayed there until 1942, when it moved to the 14th floor of the Empire State Building. Trump Tower was used as the face of Bruce Wayne's massive multinational corporation, Wayne Enterprises, in The Dark Knight Rises. It definitely has the look of corporate luxury, but I doubt there's an R&D lab with hidden Batmobiles anywhere on the floor plan. The Roosevelt Island Tramway is featured in the climactic battle in 2002’s Spider-Man, when the Green Goblin hurls Mary Jane Watson off the Queensboro Bridge. Spider-Man must choose between saving her or the passengers trapped on the tramway. Don’t worry; I won’t spoil the ending for you. Older fans still think of this as the Pan Am building, while the youngs know it as the MetLife building. But in The Avengers, it was the base of Stark Tower. Built between 1929 and 1930, the Daily News Building was headquarters for the New York Daily News until 1995. It was also the model for the headquarters of the Daily Planet — Metropolis' local newspaper and Clark Kent's employer — in 1978's Superman and its sequels. If there were a “Most Interesting Man In Comic Books,” that man would be Doc Savage. The New York City-based hero-adventurer isn’t only cool just because he’s a physician, surgeon, scientist, inventor, and explorer, but because his office sits on the 86th floor of the Empire State Building. What a badass! I’m still not sure exactly how they fit printing presses and a bullpen into a building shaped like a giant flatiron, but the Flatiron Building is the home of The Daily Bugle, where Peter Parker works as a freelance photographer in the Spider-Man movies. Bonus bit of awesome is that it’s also Channel 6 News headquarters, where April O’Neil works in the original Teenage Mutant Ninja Turtles TV series. This apartment building was used for the exterior shots of Peter Parker’s home in Spider-Man 2 and 3. It was just a shoebox, but given rent prices in New York City these days, the perennially down-on-his-luck Parker probably couldn't afford it now. Also called “The Corner,” the J.P. Morgan Building sits across the street from the New York Stock Exchange and kitty-corner to Federal Hall. The building was used as the Gotham Stock Exchange in The Dark Knight Rises. The Brooklyn Bridge, completed in 1883, links the boroughs of Manhattan and Brooklyn. This iconic suspension bridge was the fictional location of one of the saddest moments in comic book history – the death of Gwen Stacy at the hands of the Green Goblin. Die-hard fans will note that the original issues of The Amazing Spider-Man #121 put the tragedy at the George Washington Bridge, despite the art depicting the Brooklyn Bridge: recent reprints have cleared things up. No, this is not the real Statue of Liberty, but you get the idea. Anyway, the real thing has been used as a location in everything from the X-Men to Spider-Man. This is fitting, since it has played a role in so many major confrontations between heroes and villains over the decades. The Sub-Mariner used it as his headquarters when he first invaded the surface world. Later, Cyborg-Superman punched Superman through it. The stories go on and on. Hitting all eleven locations will take some time — unless you’re driving something like a Ford Fiesta ST. Save the full map below and take your own super-powered adventure the next time you happen to be here in the Big Apple. And check out all the other incredible places the Fiesta Agents are visiting right here. Ray Wert is the former editor-in-chief of Jalopnik and is the founder of automotive advertising studio Tiny Toy Car.